Pershing's 35m motor yacht Mistral 55 recently underwent a thorough refit to bring her back to perfect condition and also to convert her from a private to a commercial vessel to allow her to charter. In addition to a long list of cosmetic upgrades, her hull was repainted in her original colour of DuPont McClaren silver, both twin 3700hp MTU engines and her gas turbine were serviced, the waterjets were overhauled and serviced and exterior stainless steel railings were installed for commercial compliance. Also, her audio/visual system was upgraded and the owner's study now doubles as a spare cabin with en-suite bathroom and pullout bed. Built in 2005 as part of the Pershing 115 series, this superyacht has impressive performance - triple waterjet propulsion MTU Codag engines generating 12,500 hp give her a maximum speed of 52 knots and cruising speed of 47 knots. Travelling at 45 knots she has a range of 300 nautical miles. 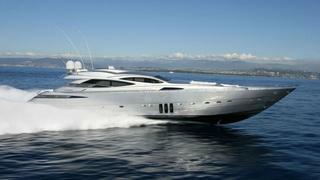 Mistral 55 is listed for sale on boatinternational.com by Moran Yacht & Ship asking €8.5 million.